Its now two months on from when the establishment elite prophesied a post BrExit economic collapse apocalypse, however subsequently a stream of economic data on the UK economy continues to paint a picture that is a the exact extreme opposite to that which the establishment and their vested interests had propagandised both before and immediately after the EU referendum vote, a message literally warning of economic collapse as the following warnings of doom from David Cameron, George Osborne and Mark Carney illustrate and that which many still blindly cling onto to this very day despite reality starting to dawn of a UK economy that is literally soaring into the stratosphere by recording unprecedented gains across several economic measures into and during the month of August. However, the PMI release for August instead of continuing to collapse into a BrExit void and thus feeding the establishment elites vested interest economists propaganda message instead did the EXACT OPPOSITE by soaring by 5 index point to a reading of 53.3 the largest rise in the indexes 25 history that sent sterling soaring and economists scrambling to cover their backs as real world economic data made a mockery of that which they pass as economic analysis regurgitated across the mainstream press. With the latest data release C-PMI showing that the services sector literally boomed during August with the index rising from 47.4 in July to 52.9, far beyond the 50 that academics had penciled in barely hours before today's data release, the largest rise in the indexes history which again prompted sterling to rocket higher to a post Brexit high. 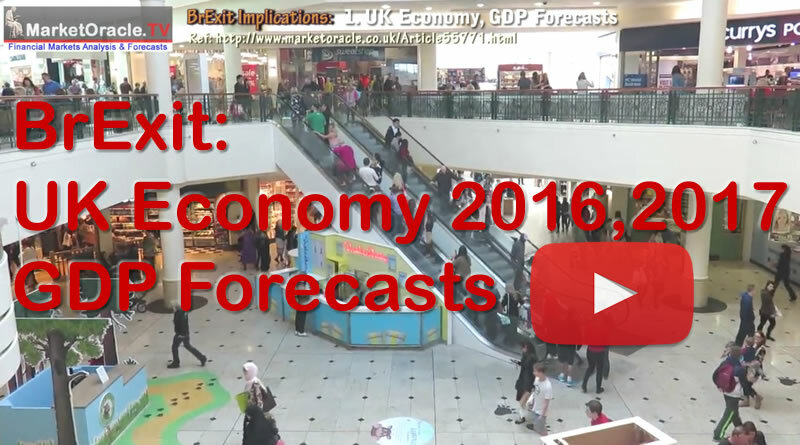 Find out what this means for the UK economy for 2016 and 2017 in my latest video analysis on the implications of BrExit.